Boston Market will gladly serve you Meatloaf, Beef Brisket and Mac and Cheese but no salt. I am not sure how sodium/salt got to be worse for you than genetically modified, pesticide ridden foods, grease, red meat, dairy products and MSG, but evidently they are. 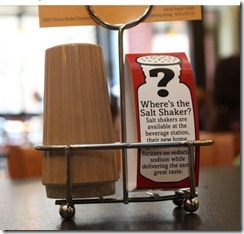 This is particularly amusing since the jury is still out on the effects of sodium on the average diner. It all depends on who you want to believe. If you don’t think it is that awful you will believe the American Journal of Hypertension. If you are in the camp that thinks it is a fact that sodium is bad for you, then you will believe the USDA. But even more to the point is the irony of an industry that is dedicated to promoting toxic food additives creating sodium as the straw man of the month. Never mind that MSG makes you fat and diminishes your brain function. Or that meat and dairy products clog your arteries and lower your body’s immune system. The real enemy (according to them) is table salt! 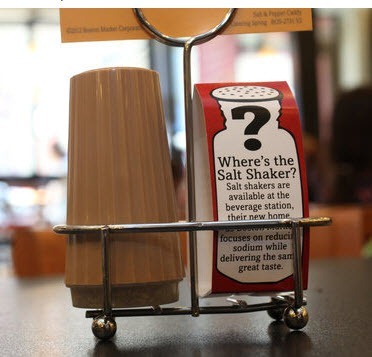 Hmmm!.And since we are taking about an industry operating in lock step, it is no surprise that Subway, Olive Garden, Red Lobster, Burger King and Taco Bell have all taken a vow to reduce sodium in their menu items. I don’t know about you, but I think I am adult enough to figure out how much to salt my food. If these companies want to do us a real service they could provide an accurate list of ingredients and nutritional information on each item. Given information, the consumer is free to make up there own mind. This entry was posted in excitotoxins, Food Additives, GMO foods, processed food, Resturants and tagged dairy products, Monosodium glutamate, Sodium compounds, Sodium controversy, the American Journal, toxic food additives creating sodium, USDA. Bookmark the permalink.